A minor is an opportunity to explore a secondary program of study for personal interest beyond your degree program or to augment your current program of study to expand your academic experience. Customize your degree to include a complementary subject combination that can enhance your employment opportunities. Below you will find some unique minor suggestions for you to consider! The accounting minor offers a pathway into an assortment of accounting career opportunities for those with an aptitude for numbers, organizing, and analytical problem-solving skills. This minor paves the way into studies for a CPA designation and boasts an excellent pass rate for its graduates. A minor in Anishinaabe Studies is available to students who are qualifying for a degree program. The Anishinaabe Studies minor explores the enduring history of Anishinaabe, the original peoples of this part of the world. Through a culture-based curriculum, students will learn Anishinaabe history, philosophy and worldview, experiencing and exploring the importance of self-knowledge and the ways in which knowledge creates pathways for interpersonal and intercultural respect. Graduates will understand the relatively recent influence of colonization, consequential social issues, and significant contemporary movements in Anishinaabe society. They will further develop broad cross-cultural understanding and experience both traditional and contemporary Anishinaabe research methodologies, as they relate to other research paradigms. This minor concerns the study of Canadian politics and government, public policy, and public administration, with particular emphasis on decision-making at the federal and provincial levels, Indigenous politics, Canadian identity and nationalism, federal provincial relations, and foreign policy. In the computer game technology minor, students will apply their foundational programming knowledge to the design and development of video game software. The program focuses on a complete overview of game development, from the initial code to the finished product, with courses covering computer graphics, the games marketplace, game artificial intelligence, and gameplay design. Students will develop skills in the analysis, design, programming, and testing of computer consoles, mobiles, PC, and hand-held video games. Graduates of this specialization often use their gaming projects courses to develop a sophisticated portfolio that can be used when seeking employment. The computer game technology and creative arts minor enables students who are interested in the artistic aspects of computer games, such as the writing of plots, the development of game flow, and the development of graphics and music, to extend their analysis and design skills to these areas. Courses include those in the games marketplace, software engineering, gameplay design, and artificial intelligence. In addition to the courses taken within the standard computer games technology stream, in the creative arts specialization, students will also explore courses in music, English and/or fine arts to develop a game design complement to their programming skills. Students must complete at least 18 credits in English, fine arts, and/or music. Training in finance and economics helps students develop logical ways of thinking and problem solving, applicable to the business world and their personal lives. This minor provides students with an interdisciplinary approach to understanding environmental sustainability, drawing on critical ecological theory, diverse issues in environmental justice and ecological economics, and applied approaches to ecological and community resilience. Students will explore diverse strategies to solving sustainable community development problems, and the building of collaborative and inclusive environmental initiatives that emphasize a re-localization of economies. The French language is spoken by over 200 million people on five different continents as the first or second language. Other than English, French is the only other language taught around the world in every country as a foreign language. French has the status of being an official language in 32 countries and governments around the globe. In Canada alone, 9.6 million people speak French and French is one of two official languages. Due to small class sizes, a minor in French provides students with the opportunity to hone their French speaking and reading skills. Students will benefit from individual attention from professors, who can help with annunciation and pronunciation to make them proficient in the language. This minor provides students with information in regards to the gathering, storing, processing, and delivering of geographic information, or spatially referenced information. Students will be introduced to the world of cartography, geographic information systems (GIS), remote sensing of the environment, and air photo interpretation. This minor provides students with the opportunity to study a range of areas, perspectives, and issues in human development. It can be used to provide a basic understanding of some human developmental issues that would be relevant to those who wish to work with children, youth, or families in various fields. A minor in human resources management prepares students for a career in compensation, training and development, recruitment and selection, strategic human resource planning, industrial relations, and health and safety. International Relations concerns the study of war and peace, the distribution of power at the regional and global levels, and the causes and consequences of international organization, cooperation, and law. Students will gain insight into the nature of diplomacy, foreign policy, decision-making, problem-solving, and key trends and transformations that have come to shape contemporary world politics. A minor in marketing offers students an opportunity to combine their business skills and creativity. Students cover general and advanced marketing concepts, and courses investigate how these concepts are used in various businesses and markets. Mathematics is the language of science. Increasingly, it is also the language of finance and the high-tech industry. Math is not just a powerful problem-solving tool; it is also a highly creative intellectual pursuit that combines intuition, imagination, and logic. Math is used in everyday life, including in the telling of time, the movement of vehicles, and the playing of sports. It’s also used in more complex research, including biomedical engineering, food technology, chemical sciences, civil and structural engineering, mining, and so much more. A minor in mathematics will cover practical topics like the applications of math and data analysis, as well as highly theoretical and abstract concepts. The Mobile Software Engineering minor enables the student to apply the foundation skills of Computer Science to the development of applications and systems that implement the use of mobile devices in modern computer systems. This allows them to develop expertise in what is becoming a predominant part of the application of computer technology. The students will study the range of applications of mobile devices and will learn to develop applications on a variety of mobile platforms. The graduate will be able to apply the use of mobile devices in business, industry, social media and gaming. The specialization requires the student to do at least one major project that can form the basis for a portfolio of skills as they seek employment in the industry. At Algoma University, a rich Music Program offers all students the possibility to earn a minor in music. Students have the freedom to create a 24-credit music minor ‘track’ in-line with targeted musical interests. Over the years, many students have taken advantage of the opportunity to earn a Music minor during their time at Algoma University. For more information, view the Music Minor Tracks (PDF) document. This minor provides students with a critical focus on globalization and its impact on communities within a holistic, interdisciplinary framework. Students will explore multiple conceptual and theoretical bases for community development knowledge and practice, including the social construction of theory and practice that may reflect social injustices. The study of Visual Art is an exciting and challenging path to self-knowledge, and understanding one’s relationship to the world. 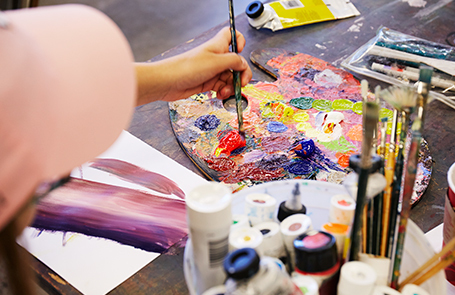 Whether your major area of study is in the Sciences, Social Sciences or Humanities, a minor in Visual Art can provide you opportunities to develop your critical thinking, problem solving skills, and versatility. Students who study Visual Art are adaptive to new and emerging technologies and skilled at approaching problems with innovation and creativity. Collaborative studio work and group critiques develop an appreciation for the alternative outlooks that people from various backgrounds may bring to projects, problems, and solutions. The Visual Art minor has all kinds of possibilities, for example; Computer Gaming students developing their drawing and design skills with a Visual Art Minor, and Psychology students augmenting their studies with a view towards a career in Art Therapy.